Trauma to the ankle joint, particularly inversion sprains, are among the most common injuries in sport. Some 50% of inversion injuries are sport-related, comprising about 25% of all musculoskeletal injuries and most individuals are below 35 years of age. These types of injuries are seen most in those athletes participating in football sports, basketball/netball, running, ballet/dancing. The lateral ligament complex is affected in ¾ of ankle injuries. Being regarded as the weakest of the three ligaments, the anterior talofibular ligament (ATFL) is involved in up to 85% of sprains, whereas the calcaneofibular ligament (CFL) is injured in 50% to 75% of cases; the posterior talofibular ligament is least involved, at less than 10%. Depending on the forces involved and ankle joint position during the force, syndesmosis, medial ligament complex, tendon, bone, cartilage and capsular damage may also occur. Inadequate diagnosis and treatment of ankle injuries may result in osteoarthrosis/osteoarthritis and chronic instability in particular. Regarding lateral ligament injury, the grading/staging classification is determined based upon patient symptoms, affected anatomy, mechanism of injury, relative stability and overall severity; however, a classification is not relevant unless it influences decisions about prognosis and clinical care. Furthermore, the typical I, II, III classification system is only valid 4-5 days post-trauma, when haematoma can be differentiated from oedema and anterior drawer test findings can be considered reliable during clinical examination. Swelling, haematoma, positive anterior drawer test and localised tenderness to palpation are the most important physical exam findings for suspected lateral ligament injury. For evaluation of ligament injury only, MRI is not considered necessary, since grade I/II and even grade III injuries are typically best managed conservatively, rather the surgically. For understanding of injury to other structures, such as when pain persists beyond expected ligament healing time, MRI is indicated; fractures, bone bruising, capsular, osteochondral and syndesmotic pathology need to be excluded/confirmed. As with most musculoskeletal injuries, more accurate diagnosis is achieved with the combination of clinical history/examination, strategic imaging – particularly MRI and ultrasound – and sometimes arthroscopy. 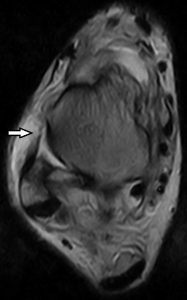 In a study by Joshy et al, the accuracy of MRI in detecting ATFL, CFL and osteochondral lesions was found to be 91.7%, 87.5% and 83.3% respectively. Mr T, a 28 year old office worker was referred by his physiotherapist for a right ankle MRI study in relation to a basketball inversion injury sustained 10 days prior. Pain, swelling, restriction of movement and tenderness over distal fibula and lateral ligaments were key examination findings. Mild anterior subluxation of the talus in relation to the distal tibial articular surface. Focal areas of impaction injury and marrow contusion involving the posterior aspect of the distal tibial articular surface, postero-medial aspect of the talar dome and the inferior aspect of the talar head. Grade III strain of the anterior talo-fibular ligament, grade II strain of the calcaneo-fibular ligament and grade I strain of the posterior talo-fibular ligament. Grade I/II strain of the deltoid ligament. Grade I strain of the cervical and inter-osseous ligaments of the sinus tarsi. 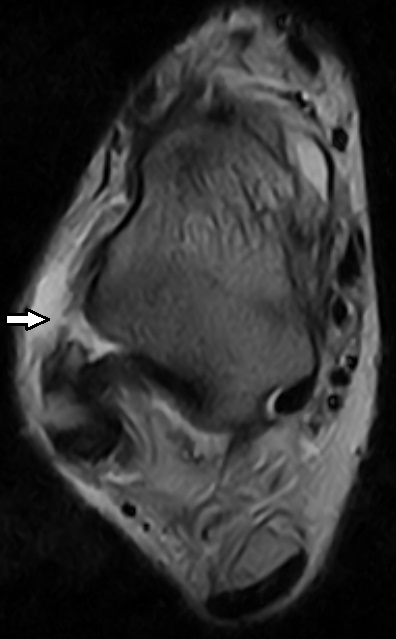 Mild tendinosis of the peroneus longus and brevis tendons in their retromalleolar and inframalleolar segments. Moderate to extensive soft tissue oedema around the distal calf, ankle joint and hindfoot, most marked along the lateral aspect. Note: Image appearance is strongly influenced by computer monitor resolution; regular office computer monitors have lower resolution than the high-end monitors used by radiologists and in radiology centres. If we can be of assistance with ankle imaging, contact us on 03 9592 3319.
 van den Bekerom M, et al. Management of acute lateral ankle ligament injury in the athlete. Knee Surg Sports Traumatol Arthrosc 2013;21:1390-1395. Roemer F, et al. Ligamentous injuries and the risk of associated tissue damage in acute ankle sprains in athletes. Am J Sports Med 2014;42(7):1549-1557. Joshy S, et al. 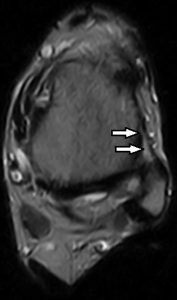 Accuracy of MRI scan in the diagnosis of ligamentous and chondral pathology in the ankle. Foot and Ankle Surg 2010;16:78-80.